Rebel Babe Box is a quarterly subscription box from Rebellia Clothing. (If you’re not familiar with Rebellia Clothing, they offer fashionable clothing that fits for women who lift weights and who may have trouble finding clothing in department stores.) You’ll get a dress or seasonal clothing item (tailored to your measurements) plus some beauty items and snacks. The box came with this information card detailing some of the items from the box. You don’t see a picture of this out of the wrapper because it has an issue staying solid at room temperature. I am surprised this only has 9 grams of sugar considering the ingredients list includes tapioca syrup, brown rice syrup, glucose, toffee (which is caramelized molasses with butter), and sugar (it also has stevia just for good measure but the stevia bitterness is kind of lost with all the other sweeteners). I think maybe the person who wrote the label needs to review what “added sugars” means because this says it has 0 grams of those and, well, that’s just not true. Not with that ingredients list. That being said, this has nice levels of protein and fiber (and a little caffeine although only about as much as one cup of coffee and half this bar consumed late at night did not keep me up) and a good deal of potassium to help balance out the sodium. It tasted pretty good, too, and was an entirely new brand for me. If you have allergies, though, stay away (this has peanut butter, wheat, and dairy, as well as soy lecithin). This is a cold brew matcha. Although I drink a lot of tea, I don’t like to drink matcha. It doesn’t really dissolve and I have texture issues. But I do like all the nutrients and antioxidants in matcha, so I put it in my smoothies every morning. These packets are the perfect size for that. 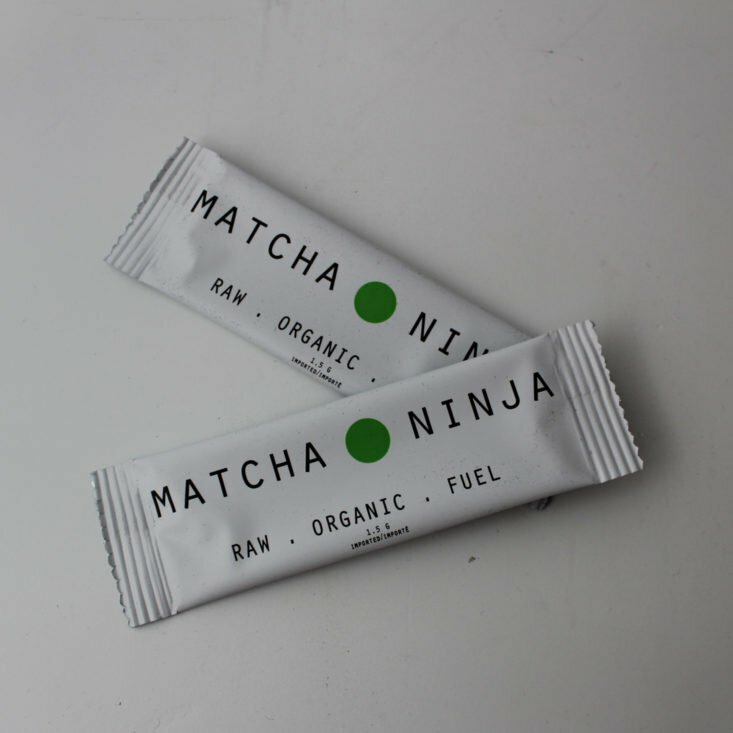 And, this is quite reasonably priced for ceremonial grade matcha (which is greener in color than culinary grade). This is another new brand for me. This is basically solid lotion with essential oils. So it works based on scent, which means you would want to reapply often, because if you can’t smell the essential oils, neither can the bugs. (Also, this is not going to be a substitute for DEET if you are worried about ticks and/or disease-carrying mosquitoes.) I tried this before a walk around the neighborhood and I didn’t get any bug bites, but I would feel more comfortable using it regularly if I knew what the essential oil blend was because over time I do sometimes have reactions to essential oils in skincare products. I’ve received this product now and again in vegan/natural subscription boxes. I like this activewear version better than the regular because the only scent is from tea tree oil, which I know I can use without issues (that is not true for some other fragrances and essential oils). Tea tree oil has some antibacterial activity and this also has a few enzymes to work on stains. I used this to do laundry, just because, but for some reason, I just don’t end up with the set-in odors and stains in my workout clothes that this is marketed towards, so I don’t know how it would actually work on those items. It’s worth a try (and you can get sample packs on the manufacturer’s website) if this is an issue for you. There was also some literature about how to use this detergent as a soak before washing. Seems convenient – soak and throw in the washing machine with no extra steps. I have a serious weakness for boxed macaroni and cheese. This is vegetarian but not vegan (lots and lots of dairy) and the pasta has pea protein added so that this has 20 grams of protein per serving, which is a lot, actually. And, this is another new brand for me. It is hard, these days, for subscription boxes, especially fitness and snack ones, to surprise me with the food items, since I’ve seen so many, but this made me happy. I don’t know that I would buy it all the time when Kraft costs way less, but it wasn’t bad, and if you are looking to add bulk, this could be helpful and a nice change of pace from protein bars and shakes. These are exclusive to the box. You guys. You will not see me modeling shorts like this on this website. I am 40 and I have spider veins and cellulite and a weird abdomen that is not yet back to normal after a hysterectomy last year and so even though these do fit (you provide a lot of measurements at sign up) I am not comfortable with putting them on and getting my picture taken. I do like the color a lot and would be happy to see leggings in a similar design, as they seem well-made. 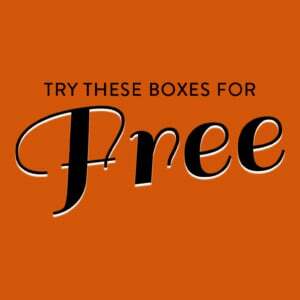 One dress or seasonal clothing item is guaranteed in each box. And it will be sized according to detailed measurements you provide at sign-up. This dress is not in the Rebellia Clothing shop so I’m not sure how to assess the value, as it is Rebellia branded and can’t be purchased anywhere else. I was having issues with it riding up a bit when I walked so I did put on a pair of yoga pants underneath. But I thought it could stand to have some color added, anyway! Because this is pretty basic, there are a lot of different directions you could go in terms of accessories. I could probably even make it suitable for work with appropriate leggings (or shapewear) and a long-sleeved button-down shirt worn like a jacket over it. It’s also a great opportunity to wear elaborate and/or long necklaces since there are no patterns in the fabric to distract from the jewelry. The fit here was also very good. These were unbranded so I don’t know how to assess value here, either, because a lot of the value in jewelry items lies in the type of metal findings and also the source/quality of the druzy, which I am definitely not an expert at judging. I coated the posts with clear nail polish just to be sure. These are fairly large and might bump into nearby studs if you have two piercings. But they are not too heavy and they don’t get tangled in my hair, and I am fine with the color I received (I gather different colors were possible). Verdict: I didn’t calculate a total value for Rebel Babe Box because not all of the items were available online. This box costs $79.99, including free shipping. The three most expensive items, by my estimation, are the dress, the shorts, and the earrings. The cheapest dress in the Rebellia shop is $34, and their shorts run from about $35 to about $50 (though, granted, none of those are really athletic in style). Some similar earrings in Box of Happies were given a value of $10. So among those three items, even assuming the lowest value of the possible range, you are getting really close to the per-box price and that’s without considering the lotion stick, laundry detergent sample, or snacks. So from a value perspective, I feel like this box is a pretty good deal, especially since it includes some exclusive styles of clothing. Can you still get this box if you sign up today? No, this was the summer box. If you order before September 19, you’ll get the fall box (which ships the week of September 25). Value Breakdown: This box costs $79.99 + free shipping, which means that each of the 8 items in the box has an average cost of $10. Check out all of our Rebel Babe Box reviews and more lifestyle, beauty, and fashion subscriptions in the Women’s Subscription Boxes List! What did you think of the Summer Rebel Babe Box? How do subscribers rate Rebel Babe Box? Do you subscribe to Rebel Babe Box? Add your rating now! I’d be disappointed to receive booty shorts. Quality or not, I’m 5’8, and that usually makes them extra scandalous on me. I like knowing I’m still covered if I bend down. I love the way you styled that dress! It’s a really pulled together look and I think it reflects your confidence. You look stunning to me 🙂 who needs booty shorts anyways? The only time they’d get worn by me.is running from my bathroom and jumping in bed. Thanks for review. Ragan, I have always had so much admiration for your knowledge of ingredients and synthesis of same, and now, great respect because you have a positive self- image and are self- assured enough to say ” Not going to be photographed in these shorts”. You are a lady of fierce strength, Ragan, and your knowledge base is so utterly impressive. You are beautiful just as you are, but I remember worrying about getting well and strong after the same surgery you’ve had. You WILL heal completely from the abdominal surgery. P.S.– TOTALLY not talking about your beautiful size and shape! You look fab all the time. I’m talking about the muscle memory that has to return that we feel internally… It’s very similar to having a C- Section with the longer vertical incision. Body gets back in shape, but everything feels a bit differently to the woman ( or did for me) for about a year as muscles I didn’t even know I had regained strength and recoil.